Advice on the best ways to build muscle will send you off in all kinds of directions, but here are two fundamental truths that cut through the BS. When it comes to building muscle, many people spend far too much time chasing “hacks,” shortcuts, and “secrets” and far too little time focusing on the fundamentals–the 20% that delivers 80% of the results. I should know because I used to be one of those people. I used to spend hundreds of dollars on worthless supplements every month. For years I hopped from workout program to trainer to another, and from one diet regimen to diet “hack” to another. Building muscle just isn’t that complicated. It requires that you understand a handful of principles and do a handful of things consistently and correctly. It requires patience and diligence, not innovation and extremism. In this article, I want to share with you what I feel are the two most important aspects of building muscle. Get these two things right, and you will build muscle and strength. Get them wrong, and you’ll struggle just as I once did. What are your thoughts on the best ways to build muscle? Have anything else to share? Let me know in the comments below! I’ve made a lot of mistakes in my years in the gym, and one of the biggest was doing too much high-rep, “hypertrophy” training. You know, the types of workouts we see in all the magazines: 8 to 12 reps per set, tons of sets, drop sets, super sets, giant sets, and so forth. I did these types of workouts for about 7 years, 3 to 5 days per week, with no major breaks, and all it got me was about 25 pounds of muscle and middling strength. I guess I looked okay, but not for 7 years of consistent training. And I was, relatively speaking, pretty darn weak too. I could bench press and squat about 225 pounds for a few reps on a good day. I could shoulder press what I curled. I wasn’t deadlifting at all. My body wasn’t changing, either. I had looked more or less like this for the previous 2 to 3 years and thought I may have just reached my genetic potential. Sure, I had learned to diet along the way, but I was also stronger than ever. There were a few “watershed moments” that account for these dramatic changes, and the primary one was the realization of how important heavy weightlifting is for building muscle. The big “a-ha” was that high-rep training and “feeling the burn” should never be the focus of a natural weightlifter. Our primary goal in the gym is to get stronger. An emphasis on high-rep training simply can’t build the amount of muscle it takes to go from “normal” to “ripped” (about 40 to 50 pounds for the average guy, and half that for the average girl). The only reliable way to do this is to push, pull, and squat large amounts of weight, week in and week out. The single rep range I’ve found most effective is the 4 to 6 rep range, which has you lifting about 80 – 85% of your one-rep max. This rep range is an incredibly effective way to stimulate both myofibrillar and sarcoplasmic hypertrophy, resulting in big, dense, strong muscles that don’t disappear when your pump subsides or when you get lean. Trust me on this one–the big, shredded guys that do 15-25 sets per workout, 10-12+ reps per set, with supersets, drop sets, and other fancy rep schemes, can only look like they do because of drugs. This applies equally to men and women, although women generally can’t do as much heavy weightlifting in each workout as men as their bodies produce much less testosterone and thus can’t repair muscle as effectively. This is why I recommend women start in the 8 to 10 rep range and, as they get stronger, start adding in some 4 to 6 rep work on their big compound lifts like the squat, deadlift, military and bench press. I spun my wheels for years before learning this lesson. Don’t make the same mistake. Every aspect of getting fit–diet, training, supplementation–has its heated controversies, and one of the ongoing nutritional spats is whether “bulking and cutting” actually works. 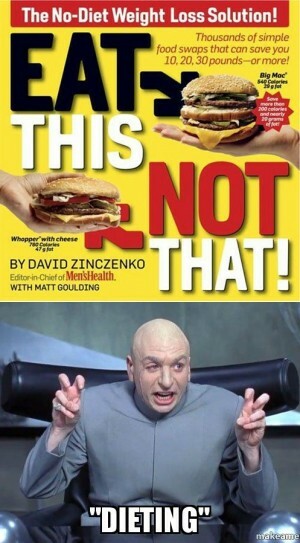 Many people believe in “keeping it simple, stupid” and stick to the old bodybuilding adage of having to “eat big to get big,” and to the ordeal of near-starvation and hours of incline treadmill walking to get lean, while others claim that bulking and cutting is antiquated and nonsensical, and that building muscle without gaining fat (“recomping”) is the new era of bodybuilding. Well, the truth is both of these groups are right and wrong. When done correctly, bulk and cutting is the most effective way to build an impressive physique, and when done incorrectly, it’s an extremely effective way to stick yourself in a narrow, deep rut. To understand why, let’s review a a quick bit of physiology. One of the big “secrets” to building muscle is eating enough food. Most people know that you have to eat enough protein to build muscle, but many people don’t know that you also have to eat enough calories. You see, your body burns energy to stay alive and you feed it energy by eating food. The relationship of these amounts–energy burned versus energy consumed–is known as energy balance. If you feed your body less energy than it burns every day, you’ve put it into what is known as a “calorie deficit.” This is a negative energy balance (the body is burning more energy than it’s consuming), and the result is weight loss (the loss of water, glycogen, fat, and sometimes muscle). One of the “side effects” of being in a calorie deficit is your body’s ability to create muscle proteins becomes impaired. That is, it can’t build muscle efficiently when it’s in a calorie deficit, and that’s why it’s generally accepted that you can’t build muscle and lose fat at the same time. No matter how you eat your food–intermittent fasting, carb cycling, IIFYM, etc.–if you’re in a calorie deficit several days per week, and if you’re a relatively lean, experienced weightlifter, you will build little-to-no muscle. There’s just not way to naturally cheat this physiological mechanism. The easiest way to ensure you’re not in a calorie deficit is to slightly overshoot your body’s energy needs, keeping it in a positive energy balance or “calorie surplus.” This is what “bulking” is, and it’s scientifically sound and supported by decades of bodybuilding research and results. The traditional “bulk” is like a dietary sledgehammer: it has you slamming down thousands upon thousands of calories every day, getting fatter and fatter, without really knowing why. While that’s one way to ensure you’re in a calorie surplus, does building muscle really require that much eating? Fortunately for our wallets, stomachs, and sanity, it doesn’t. And in fact, it can actually be counter-productive. The major problem with maintaining a large calorie surplus is you gain fat very quickly, and this in turn gets in the way of building muscle. As the body becomes more insulin resistant, its ability to burn fat decreases, and the likelihood of storing carbohydrate as fat increases. Furthermore, insulin resistance suppresses intracellular signaling responsible for protein synthesis, which means less total muscle growth. And free testosterone levels drop and estrogen levels rise. As testosterone plays a vital role in the process of muscle building, and high levels of estrogen promotes fat storage, the downsides here are clear. The bottom line is the fatter you get, the less muscle you’re going to build, and this is why I recommend that guys never go above 15 to 17% body fat and that girls never go above 25 to 27%. And that once someone reaches this point, he/she diets down to about 10% (men)/20% (women) before going into a calorie surplus again. How to calculate a proper calorie surplus for building muscle. Eat 10% more calories than you burn every day to maximize muscle growth and minimize fat storage. This gives you a good approximation of your total daily energy expenditure (TDEE), which is simply the total amount of calories you’re burning each day. To put yourself in a 10% surplus, multiply your TDEE by 1.1 and voila, you’ve got your starting point. For example, I currently weigh 193, I’m about 7.5% body fat, and I exercise 5 – 6 hours per week. My BMR is about 2,200 calories per day. I then multiply that by 1.4 to get my total daily expenditure, which is about 3,080 calories per day. I then multiply that by 1.1 to get my bulking calories, which is 3,400 per day. You’ll know you have it right when you’re steadily getting stronger and gaining 0.5 to 1 (men)/0.25 to 0.5 (women) pounds per week. And in terms of muscle:fat ratio, most people will gain at a 1:1 rate (1 pound of muscle for every pound of fat), but some people tend to gain a little more muscle than fat while others experience the opposite. That’s genetics for you. The worst way to lose fat. 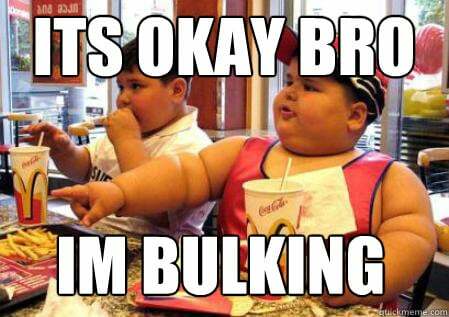 So that’s bulking. Let’s now talk cutting, which requires that we keep our bodies in a calorie deficit to lose fat. There’s no arguing the physiology–no calorie deficit means no fat loss–but there are right and wrong ways of going about it. And the wrong ways are much more prevalent and are what give cutting a bad name. Specifically, the most common (and worst) way to cut is to dramatically reduce your food intake and do a ton of exercise. The combination of a large calorie deficit and high amount of exercise is simply disastrous. You lose fat, but you also lose muscle, and the less you eat, the more you lose. And as you lose muscle, your body not only begins to take on that amorphous “skinny fat look,” but your metabolism slows down, your bone health decreases, and your risk of disease increases. You also feel progressively worse and worse. Your energy levels plummet, you battle intense food cravings, you become mentally clouded and even depressed, and more. A much better way of going about it is maintaining a moderate caloric restriction of about 20 to 25% (eat about 75 to 80% of the energy your body burns every day). This will enable you to lose 1-2 lbs of fat per week while preserving your metabolic health, energy levels, mental balance, and mood. And in terms of exercise amount and intensity, a good place to start is 3 to 5 weightlifting sessions per week and 3 20 to 25-minute high intensity interval cardio sessions per week. This will burn plenty of energy to help accelerate the fat loss, and it’s also effective for preserving muscle, which is just as important as losing fat when you’re in a calorie deficit. The second worst way to lose fat. When the goal is building a great physique, another big fat loss mistake is “slow cutting,” which is the slow loss of body fat over time by using a smaller calorie deficit of 5 to 10%. At first, slow cutting would seem to be beneficial. You get to eat more food, which means less hunger and better workouts, and you still lose fat (albeit slowly). The problem, however, is that the slight calorie deficit still impairs muscle growth, which means the longer you “slow cut,” the more time you’re not building muscle. This insidious mistake that can really hurt your long-term results because if you’re still working on your physique and need to build more muscle to reach your goal, you can waste a lot of time and potential muscle growth. 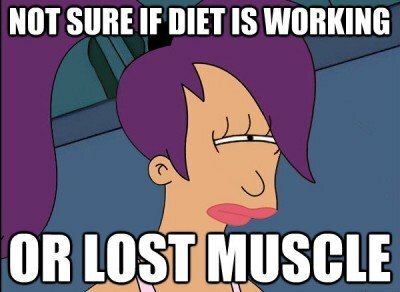 I’ve seen people really mess this up and gain anywhere from 1/2 to even 1/3 the amount of muscle they could have over the course of anywhere from 6 to 12 months by simply remaining in a mild calorie deficit for far too long. This is why I recommend people use every safe, scientifically validated strategy for maximizing fat loss when cutting. The goal is to get rid of the fat as quickly as comfortably possible and get out of the calorie deficit and back to building muscle. Putting it all together: correct versus incorrect bulking and cutting. We’ve covered a lot of ground here, so I’d like to give you a simple summary of bulking and cutting. Eat way too much while bulking and gain way too much fat too fast. This slows down muscle growth and forces you to flip to a calorie deficit to lose fat after only a couple months, which isn’t enough time to build a considerable amount of muscle. Eat way too little and exercise way too much while cutting and lose nearly equal amounts of muscle and fat. This often causes you to lose whatever muscle you gained while bulking and puts you back to square zero in terms of body composition. Drag your cuts out for way too long, losing in 6 months what you could have healthily lost in 2 months. This means you spent 4 months building little-to-no muscle when you could have been bulking instead. Follow a proper meal plan while bulking, ensuring that you’re in a mild calorie surplus, and don’t let your cheat meals get out of hand. This prevent drastic overeating and allows you to stretch your bulks out for as long as possible–4 to 6 months for most people–and build a noticeable amount of muscle and strength. Utilize a safe-but-aggressive calorie deficit and proper exercise and supplementation regimen to rapidly strip off fat while preserving muscle. This allows you to keep your cuts relatively short (2 to 3 months for most people) and retain the muscle gained while bulking, which lets you get back to adding more muscle to your physique as quickly as possible. If you make these simple changes to your workouts and diet–if you focus on heavy, compound weightlifting and if you bulk and cut correctly–you’ll see drastic changes in your body. You’ll gain muscle and strength faster than ever before and come to same realization that I did–that if you just do this long enough, you’re guaranteed to get the body you truly want. No more anxiety or frustration or mysteries. And that’s the real payoff–feeling completely in control of how your body develops.